The real estate bust wasn’t kind to Roost, which started out as a real estate search engine. But CEO Alex Chang took the $8 million he raised in late 2008 and convinced his investors to back him down a completely different path: a service for creating and managing social media marketing campaigns for local businesses. Roost relaunched in the middle of last year, first going after the 25,000 real estate agents who used the original Roost. Then last March, Chang opened up Roost to other local businesses. 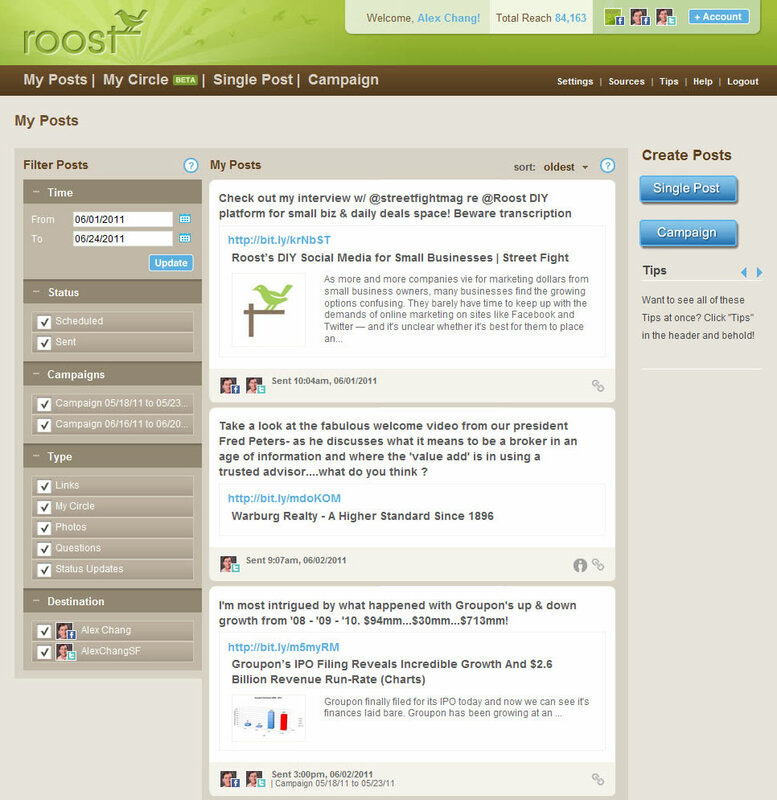 Roost taps into Facebook and Twitter, and helps restaurants, auto dealers, non-profits and others create social media campaigns in 20 minutes on a Sunday night. Merchants tell Roost what industry they are in, and Roost gives them suggested RSS feeds and other relevant content they can share with their fans, followers and customers. “These small business don’t have time, they don’t know what to post and they don’t have a big network,” says Chang. “You do all this work and you don’t get that much reach.” He is trying to solve these three problems by making Roost a low-touch product that does most of the work for the merchants. It creates an automated social media campaign that sends out status updates or Tweets periodically with links, photos, questions, and quotes. Roost also offers the ability for businesses to band together in Circles, in order to cross-promote offers, links, and other content. 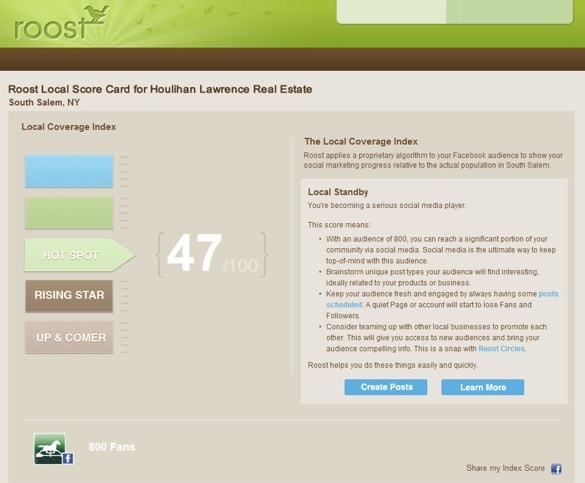 Today, Roost is launching another new feature, the Roost Local Scorecard. It looks at how many fans and likes a business has on Facebook, and how many of those are coming from people who live in the same city to give business owners a sense of how they are penetrating their local market with their social media messages. “Not all fans are created equal,” says Chang. The score is an indexed number from 1 to 100, with businesses moving up the ranks from Rising Star to Hotspot to Local Legend. Roost is free for now, but Chang plans to add premium features for which he plans to charge a monthly fee. Helping small businesses run social media campaigns is fine, but if Roost can get to the point where it is helping them track and reward customer loyalty beyond likes that is where all of this starts to get interesting.